"Our intention is that Jedi Knight Anakin should not outperform Darth Malak." Translation: "Our intention is that our playerbase will be punished for a) being smart, b) challenging the meta, c) trying to make the game fun." They're really kicking up the casino vibes here. "You'll never beat the house" really comes to mind when reading this nasty "sorry, not sorry" post. This micromanaging of competitive play is so gross and it's really taking away any fun or excitement I once felt for this game. Anyone else feel the same? Anakin, the character the entire franchise revolves around, should not outperform a one dimensional, non-canon villain from a 20 year old xbox game. Because payers come before players. How does garbage on defense and sometimes able to beat a Malak team equal "outperforming" ? Palp magically stopped working as intended and is a "cheesy strategy" but Dre/Malak autoing every team in the game is not cheesy at all. At least you needed half a brain to run Palp. Sith Assassin suffers because of the previous corny nerf. And now a nerf bomb is being dropped on Anakin because him and the overpowered Jedi that CG crafted are standing a chance against Malak. This is pathetic and ridiculous. A meta team should be defending better, its not supposed to go completely unchallenged unless its the same team with faster speed. I dont expect the playerbase/CG developers to be bestest friends foreverest but should people really have to be anxious while playing a mobile game because the developers can undo their own untested designs that are working as described? People should be saying "I really regret investing in this character because their actually pretty bad or have no relevance now" not "I really regret investing in this character because CG nerfed this character into the ground." I remember when the game would be down for an hour or two or there would be a bug in TB or a raid and CG would say "Sorry for the inconvenience here are crystals". Now CG "fixes"(nerfs) things that are working exactly as they should be because they think whales enjoy staying at the top of arena via speed based mirror matches and they never try and make good on these "fixes". There just isnt any trust anymore and CG/EA clearly doesnt care. People complain because they want to be #1 all the time, and that's not necessarily a bad thing. But I'll tell you this much--the game got so much more fun and less stressful for me when I stopped caring about Arena and let myself slide back when I was doing the Jedi Knight quest and looking for those wins with Jedi teams. I had forgotten that arena didn't have to be a slog or a timed sniper fight where I get that last win at just the right time, and I've never been a part of any shard chat (Why would I want to? I don't like most of the people on THIS forum, why find another way of connecting to people I don't like?) but I imagine that if I were, sliding back would have been a real relief. I slid back to somewhere around 400, won my battles, put my Jedi Rey team back in, climbed to around 100, and now I do just enough battles a day to ensure I'm in that 101-200 prize tier, then go do things I like instead. Sometimes that's things I like in the game, a lot of times that's things I like outside of the game. Arena isn't important. Crystals aren't important. When you die your roster or crystal stockpile won't be willed to your kin, and no one's going to carve "They Got Malak" on your tombstone. No one cares. Go to a bar, tell the bartender about your roster, they'll smile and nod because their livlihood is based on your tips, but they don't care. None of this matters. It's all something you do to keep yourself busy so you don't think about how a big rock could fall on you and then that's it. I play mostly with my real life friends and when we get together we talk about the game and what characters we like and how our various farms are going. We speculate on what characters will come when the next movie releases. That's what this game is--a reason to **** with people you like in the real world. If you're coming here to bemoan how you can't be #1 because the cool kids club on Discord says you can't sit with them or how you've got to wait another three months for Darth Revan to come out, then get a life man. Smell some flowers or something. Re: How Long Do We Have To Wait Until We're Allowed To Beat Malak? Lol - I think you're missing my point. They didn't go around nerfing everything that players used to beat JKR like they are now. This micro-managing by "reworks" and direct and indirect nerfs is a new low - even for CG. There was a time in this game's history when strategic and innovative play and good theorycrafting was rewarded. Now it's punished by nerfs, as CG has decided to prescribe play and directly manipulate players' ability to play the game. Honestly, I'm thinking about simply renaming my account "CG's Puppet" - because that's all we are. We either play the game the way they want - or they simply nerf us to force us to do so. CG: "Farm MORE Kotor for DR + Malak"
Players: "No, thank you, some of us don't like Kotor, so we'll figure out ways to beat him instead." CG: **Nerfs Palpatine/Triumverate teams vs. Malak** - oh, but refunds gear for those who had DR and Sass, since they followed orders. Players: "Well, thank you for reworking Anakin, the Chosen One, we'll try him"
I mean seriously, what's next? Is CG just going to fight my fleet and arena battles for me? And just tell me whether I won or lost based on whether or not I used the "allowed" characters or not? 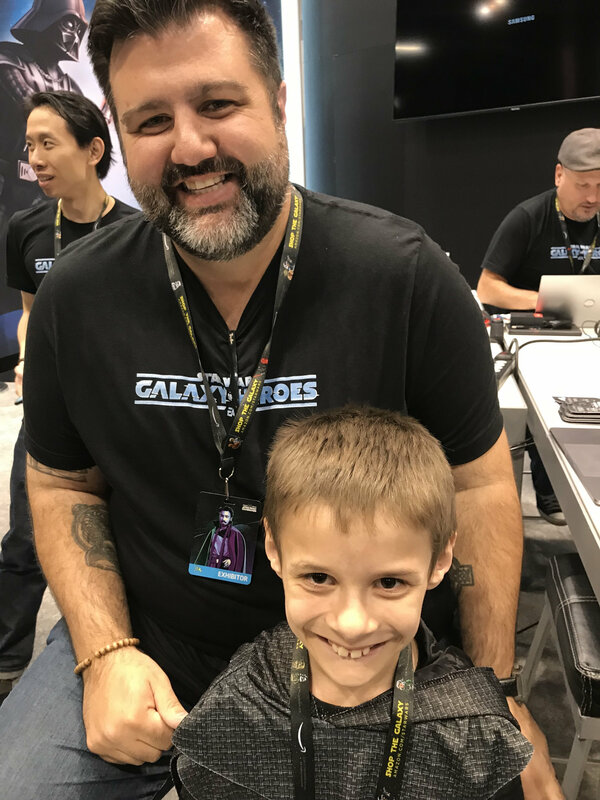 Re: SWGOH Booth at Celebration - thanks for a great time! Aye, finally a nice wholesome post. Instead of people complaining about the game. Re: Thousands of testing hours - forgot to test under jkr? Yeah, this puzzles me as well. There are issues with Revan/Malak that are unanticipated, like running Nightsister Zombie in the leader spot to abuse Revan's Deathmark mechanic, or the bad Malak AI that keeps stealing 1 health from B1 rather than someone with actual health to steal. I understand missing stuff like this in the development phase, as they are outlier cases. But for the life of me I can't comprehend a play tester not immediately plugging JKA into a JKR team to see how his kit interacts, nor can I understand missing the obviousness of the Palpatine/Vader leadership as a counter. I mean, I thought of the latter when Darth Revan's kit was revealed and he wasn't even in the game yet! I don't have a lot of sympathy, as these problems are self-inflicted. The kits have become so complicated that it's difficult to design something that slides in somewhere between OP and useless. The JKR/Jolee interaction is forever going to dominate the course of this game unless it's remedied - the obvious solution is to limit Jolee's revive mechanic a bit, but the community uproar for messing with the kit is going to be ugly. Someone earlier in this thread commented that they should slow down character releases and test them more; I'm not sure this is possible. The release cadence is already at its slowest and CG revenue is down significantly from last year; they desperately need to release something for people to buy. There's currently nothing for mid-spenders who couldn't or didn't want Malak. If you don't care about finishing top of arena, there's currently no game content that can't be finished using easily accessible F2P characters. Alot of comments are flying around about how Anakin will or should be nerfed because he enables Revan to beat Darth Revan with Malak. First of all let me throw this out there, if anyone deserves to be strong it's Anakin. I don't care if everyone has him, everyone has Jedi Revan also, everyone has CLS, everyone has Han, everyone has Yoda. They are powerful too so what? The thing is for the first time in a long time CG made a good move and turned a fan favorite from unusable to usable and now all these entitled babies who payed for Malak are about to screw this up. I don't care if you paid a million dollars for any character(s), the one fact about this game remains: no squad should be unbeatable except by mirror match. This is about ensuring that GA will stay fun. Truth is that pvp wise GA is way more popular than regular arena. Arena is nothing more than a syndicated group of players managing their payouts to maximize crystal income. Guess what you can still do that Anakin or no Anakin. Plus why are so interested in an unbeatable squad? You'll have to get out of the way for your shard mates anyways, if your shard mates don't have Malak and can't move past you how the heck is the integrity of your shard chat going to stay? Lastly let me say this because it's becoming somewhat of a joke lately, Anakin doesn't blow Revan-Malak out of the water. Anakin still loses, I just came out of a losing match using my Anakin/Jedi Revan against a Malak. My mods on Anakin, Revan and Yoda are insane they literally had my 3 best mod sets and I lost, AI targeted the wrong people what are you going to do. Anakin wins 60-80% of the time but loses 100% of the time on defense, so how do you see this as a threat? Some squad must be able to beat your Malak, this is just the way the game has been. Like Traya could beat Revan, like CLS could beat Revan some times. Everyone needs a way to lose otherwise we'll all just quit the game if we don't have Malak. If CG nerfs Anakin they are weak. Own your actions, you ARE THE DEVELOPERS, whales or not they can't boss you around and tell you what to do, you are not their employees, you don't have a contract with them. Ohh and BTW, just as f2p keep making empty threats that they will quit if this or that happens, similarly whales will make empty threats about quitting or stop spending, don't buy it, less that 5% of them actually mean it. The moment they stop spending and fall behind they will go right back to paying even more to catch up. OWN YOUR DECISIONS CG, OWN THEM. You gave us a great rework, don't mess it up. 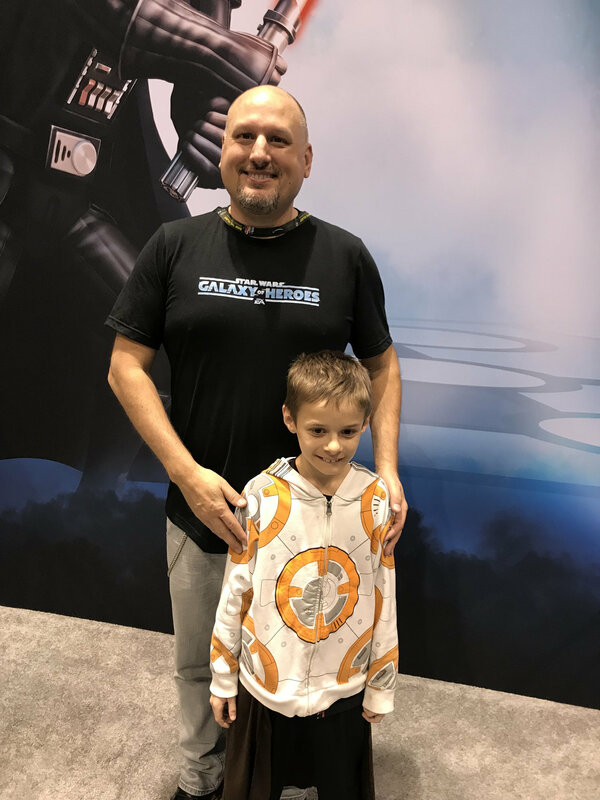 Every day my 10 year old son wanted to come by the SWGOH booth at Star Wars Celebration last week - sometimes even before we got in line for one of the morning panels (sorry, we did have to prioritize Ep 9 over the game )! He had so much fun and you all made him feel like a rockstar there. 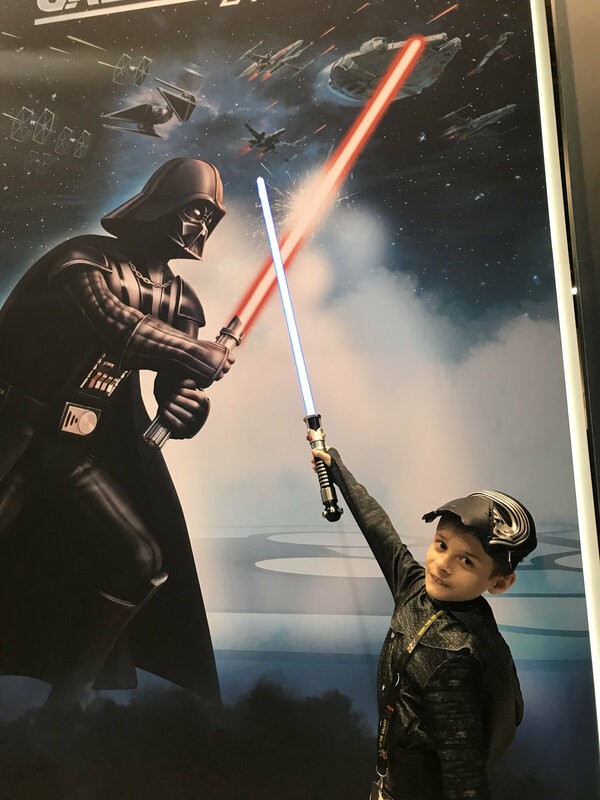 Here are a few photos from our time at your booth. The last day he just wanted to come by to tell you goodbye before we left. You all are aces in our books! Okay guys the constant whining is getting annoying. Are there issues that should be raised? Sure of course. However the constant crying of "your killing the game" or "wha wha wha something something whales" is not only non constructive its illogical. Let me give you a very simple scenario. Lets say you own a business. Lets say this business makes mobile games. 100,000 players who do contribute to your business? Sure that scenario is a loaded one no doubt. But that is a simple reality that you people need to seriously wake up to. Your constant crying literally isn't helping anyone other than making us whales laugh. Now that your ignorance has been addressed... Lets talk about the real issues. The recent screw ups with not knowing Papa Palp would kill the wanted Malak meta and making a FTP team crush a major whale team are pretty bad snafus aka Anakin.. However CG came out and copped to the screw up and hopefully they will learn from this very rough month. And as above may be frustrating to everyone the fact is a FTP team being top tier vs a major paywall team is a slap in the face to the whales. You know those people who keep the game alive with our money. So yeah sorry boys but you cant expect people to toss hundreds or thousands to have Malak and it instantly gets crushed just a few weeks after like lol. Another issue. I am all for a business being profitable and successful. However there is a difference between profitable and reckless greed. (Looking at you Carrie). I know on her personal twitter she posted a figure of what she thinks needs to be spent by a player per year to stay caught up. If this is soley her opinion it was a reckless statement. At worst it came from a internal thought of CG of what is true. If the ladder is true than CG you need to slow your role your game isn't worth 4-5k a year. Thats simple greed. And to conclude. If you want to potentially boost your profits and make both the FTP and whales happy than you need to make the content more accessible to the masses. Lower the general pricing across the board. less profit per person for sure but adds the potential of adding many more players willing to add some financial value to the game.